In recent years, Disney World has spent a lot of money on upgrading their resort area, and the upgrades continue to this day. 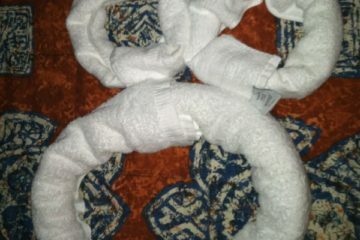 In fact, Disney is always trying to make things better at their parks and hotels. 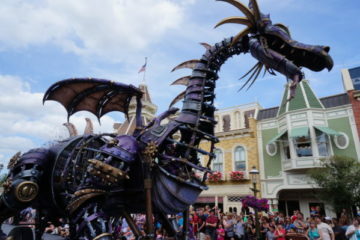 So how does Disney decide what needs a facelift and what is okay as is? Surveys! Among other things like observing people in the parks, reading online posts, conducting focus groups, and analyzing park data, surveys play an important role in finding out what guests want. They also want to know whether the data they are gathering is coming from an annual pass holder, a frequent visitor, or a first-time guest. If you’ve ever visited Disney World, you have probably seen Cast Members holding digital tablets. 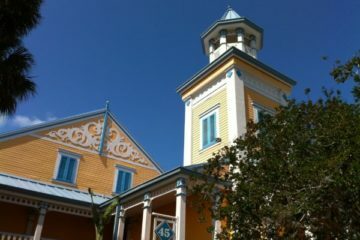 You may have even been stopped by one of these Cast Members to answer some questions about your stay at the resort. They usually ask some demographic questions like age, gender, household income, etc., and then you’ll ask you specific questions about the park you are in. 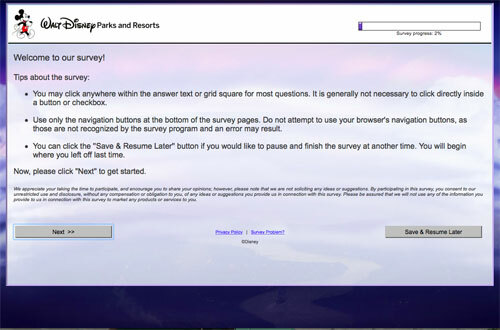 These surveys are usually to find out if you like certain attractions and if you think they need a makeover. They will probably also ask you if it’s okay to send you an e-mail at the end of your vacation to evaluate your overall satisfaction with your Disney Vacation. During a Disney Vacation last year, I was stopped by one of these Cast Members on our way out of the Animal Kingdom park. She was very polite and asked if she could ask us a few questions. We agreed, and the questions consisted mainly of what attractions we visited that day and our satisfaction with each one. 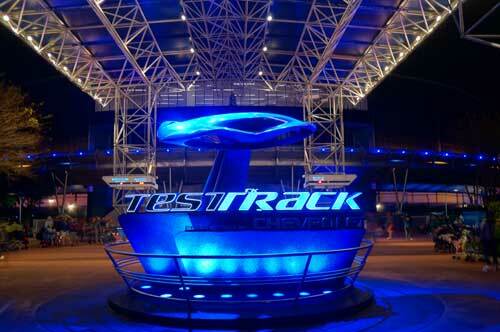 After we had completed the survey, the Cast Member offered us a FastPass voucher to make up for the time we had lost. We also received a follow-up e-mail asking about our resort experience, what we enjoyed about each park, and what we thought needed changed. The survey was quick, but I believe they asked appropriate questions to evaluate our level of satisfaction. The e-mail was also sent in a timely manner so we had time to get home and get unpacked, but it wasn’t too far from the time we returned home that we would forget important details. 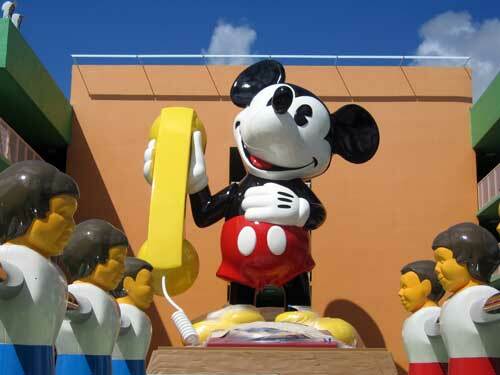 Disney also collects information from complaints and compliments submitted either on property, on the phone, by e-mail, or online. Did you know that you can’t give a Cast Member a cash tip, but compliments submitted via e-mail are much more valuable to them than cash since they will be publicly recognized by their superior and in front of their colleagues. Complaints work similarly, especially if you use specific names. Online surveys usually ask for the same demographic information. 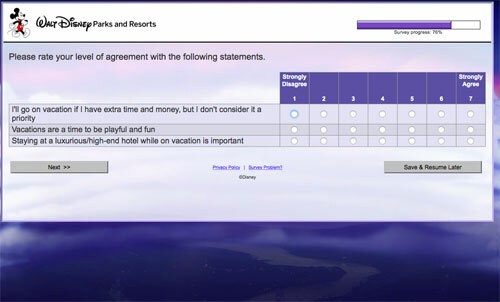 If the survey is used as a follow-up to your recent vacation, the questions will ask specific questions about your resort, the parks you visited, and any special experiences you may have scheduled like a character dining experience or a behind the scenes tour. 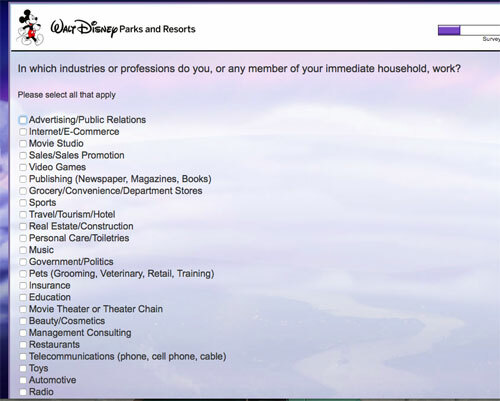 I recently received an invitation to participate in an online survey about the Disney Vacation Club. In the heart of full-disclosure, we have taken a tour and considered purchasing a DVC membership, but we haven’t done so yet. The survey began with some basic guidelines for completing the survey. The survey was pretty standard, but it was much longer than any other Disney survey I had taken. The first questions concerned demographic information including age, gender, country and state of residence, and profession. These questions not only put me into a category with other people who have completed the survey but also screen me for possible biases. For example, if I worked in the “Travel/Tourism/Hotel” field, I may not be an appropriate candidate to take a survey based on a timeshare. I may or may not be selected for the survey depending on my profession. The survey first asked some basic demographic information. 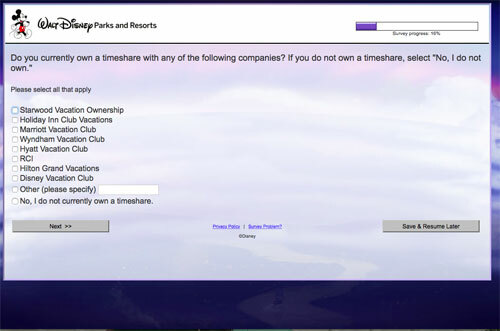 The next questions asked about timeshares other that Disney Vacation Club then got more specific from there. Presumably, if I said that I currently owned a timeshare with DVC, I would not have been asked to continue with the survey. Disney wants to know if I currently own any kind of timeshare. The questions then turned to specific Disney properties including Disney World, Disneyland, Adventures by Disney, Disney Cruise Line, and Aulani. Then my personal vacation preferences were evaluated. 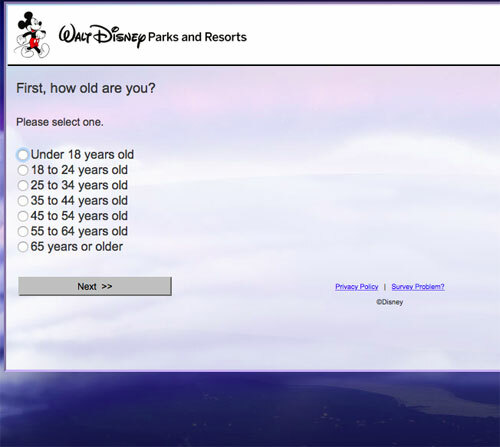 Disney uses surveys to learn more about an individual’s tendencies. 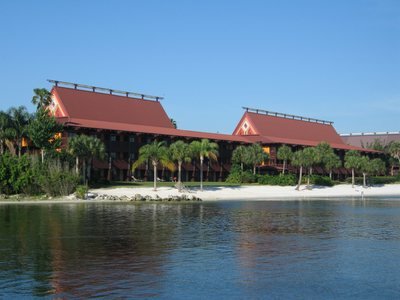 The rest of the questions asked about the Polynesian Village Resort and specifically the Deluxe Studios and Bungalows. This part got a little repetitive since there were ten groups of five items each, with very similar options in each group, to see what was most influential and least influential to my decision not to purchase a DVC membership with the Polynesian as my home resort. Options included: The bungalows cost too many points, the studios cost too many points, the studios don’t have laundry facilities, the studio’s kitchens are too small, I don’t want to my home resort in Disney World, and I want another Disney resort to be my home resort. The survey ended with a few more demographic questions including household income, number and age of children in my household, and more vacation preferences. Disney thanked me for my participation and assured me that my responses would be kept confidential. These surveys are likely very valuable to Disney because they require little manpower to conduct while yielding a high number of results. The information gathered can help Disney to evaluate general data like the demographics of the people willing to participate and specific data like whether the bungalows at the Polynesian are too expensive. Perhaps sales are suffering and Disney will lower the cost of the DVC bungalows and studios at the Polynesian based on my responses! Wouldn’t that be nice? 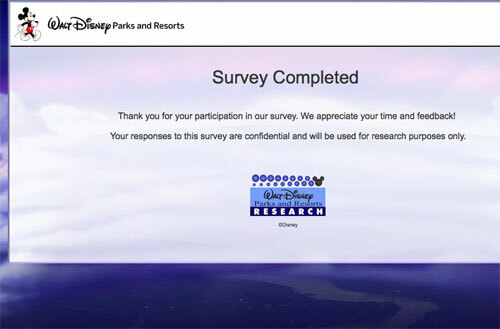 Have you ever participated in a Disney Survey? What did you think?